MONTEREY PARK, CALIFORNIA – Chinese communities in Southern California are getting ready to celebrate The Year of The Pig on February 5, and for those who believe in Buddhism going to the Buddhist temples is one of their choices. 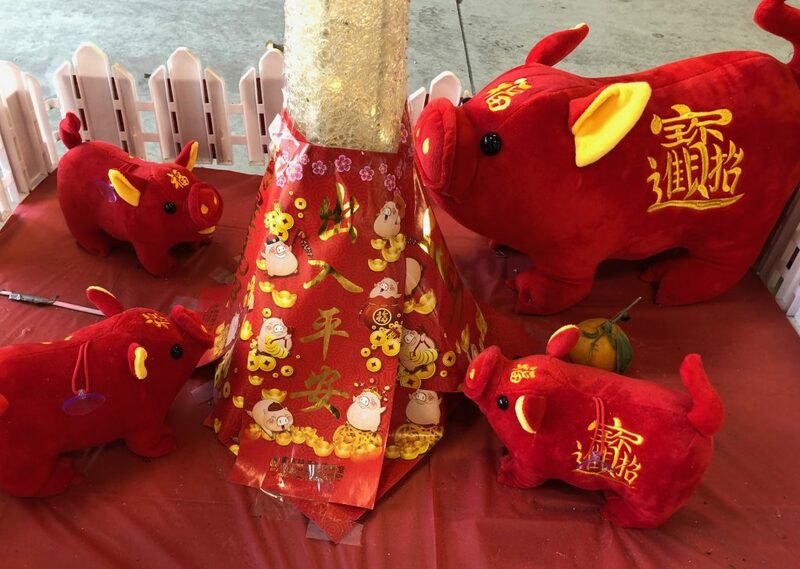 The Prajna Buddhist Mission and Wong Tai-Sen Taoism Center in Monterey Park, Southern California have begun to see more visitors in the past month who want to prey for good fortune and prosperity in the Chinese New Year, the Year of the Pig. The two temples expect to attract thousands of visitors on the night of February 4, the Chinese New Year’s Eve, which will last till the coming of the New Year at midnight into the early morning of February 5. For those wish seekers, to burn the first incense as the New Year begins is thought to bring them good fortune and prosperity for a whole year. Therefore, many people prefer to go to the temples on the New Year’s Eve and waiting for the coming of the Chinese New Year with flowers, incense burning and other forms. Last year the Prajna Buddhist Mission and Wong Tai-Sen Taoism Center saw a record number of people lining up for a chance to burn their first incense on Friday morning. The City of Monterey Park sent two police cars and three police officers to the area to make sure that the celebration went smoothly. Edward Wong, who owns the Wong Tai-Sen Taoism Center, said the two temples have served the Chinese community for the past 33 years, and each year he saw the increase of visitors during the New Year. He said many people believe the Year of the Pig will bring prosperity and harmony to them since pigs are hardworking and easy to get along with each other. In the past year, the world was not in harmony with trade wars between the United States and China, which has a bad impact on the Chinese Americans who rely on trade between the two countries for a living. “I hope and believe that the world will become more peaceful and harmonious in the Chinese Year of The Pig,” said Wong. Not only Chinese Americans but also other Asian Americans from Vietnam, Cambodia, Laos, the Philippines and other Asian countries share the same habit to celebrate the Lunar New Year, the Year of the Pigg for this year. In Chinese astrology, each year is related to a Chinese zodiac animal according to the 12-year cycle. 2019 is the Year of The Pig, while the passing year is the Year of The Dog. Statistics show that the Asian American population in Los Angeles County is over 1.4 million, which consists of 14.5 percent of the total population in the county. Chinese Americans are the largest ethnic group among Asian Americans. Both the Prajna Buddhist Mission 「般若修德善堂」and Wong Tai-Sen Taoism Center 「赤松黃大仙祠」are located at 527 S. Atlantic Blvd., Monterey Park, CA 91754. For more information, please call 626-458-2266.